The Student Analytics Report is meant to provide a portrait of an individual’s performance over the duration of a course. 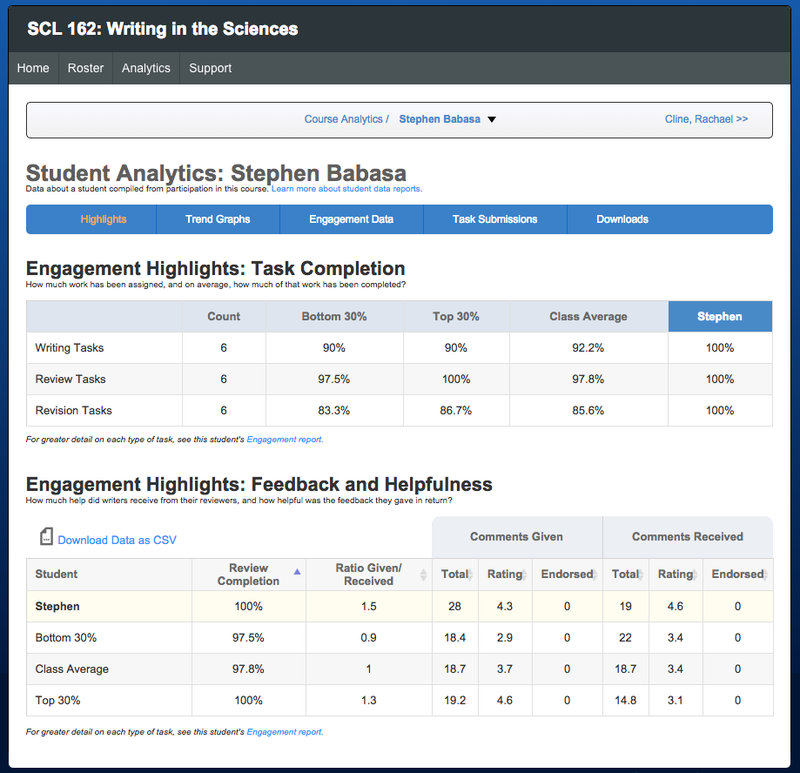 When a course is first created, the student report contains no data because there’s been no activity; the report will automatically expand as the student engages in rounds of the write-review-revise cycle. The report is an aggregate of a student’s performance in individual reviews and charts trends over time. It is meant to give instructors insight into the individual and give benchmarks for comparisons against class averages. Its companion report, the Course Analytics Report, provides similar information but at course averages and not individuals. Top 30 / Bottom 30 is calculated differently based on the specific report, but wherever possible, it is calculated based on performance on a single metric – that is, the calculation is based on student performance on that metric, rather than ranking students overall based on a summative evaluation and then selecting the top and bottom thirds. Task Completion: statistics about overall participation in individual tasks. This data can reveal the types of work instructors ask students to perform and how many of them complete that work. Feedback and Helpfulness: data about student participation in review and about the comments they exchange in that process. 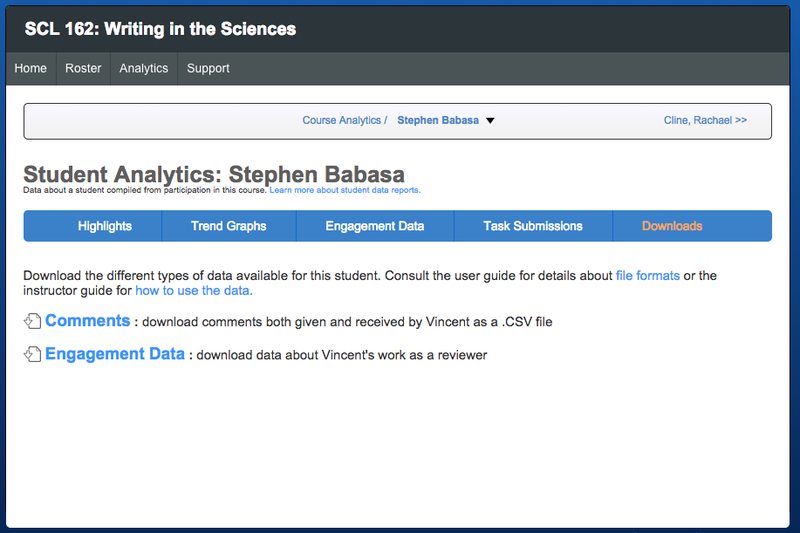 This data matches the engagement data available after individual reviews, but here allows instructors to track how students have performed across every review where comments have been enabled. The data in the Feedback and Helpfulness table can be sorted by clicking any of the column headers. It can also be downloaded as a CSV file for more advanced searching and sorting. The Engagement Data report provides similar review data but is expanded upon significantly. Students are first sorted by helpfulness ratings, and when there are ties, the next measure is ratio, followed by completion rate, then by volume. Ratio of comments given to comments received – how many comments have reviewers given compared to how many they’ve received? 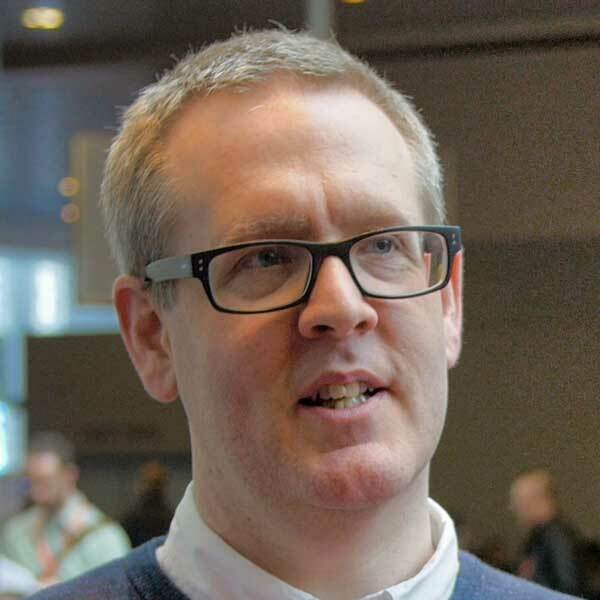 Comment volume – how much feedback have reviewers given overall? Helpfulness ratings – how helpful have writers found the feedback they received? Each graph is accompanied by a table containing all the raw data that went into plotting it as well as a toolbar enabling a number of different ways to download those materials. Each point on a graph and each column in the data tables correspond to a single review completed by students in the course. If an instructor has assigned seven reviews, there will be seven points on each graph and seven columns in each table. Hovering the cursor over any data point or column header will reveal the name of that review and its relevant measure; clicking any data point on a chart will reveal the individual report for that review. Each trend graph in the student report will have four lines plotted, corresponding with the student’s performance and the three comparison points (Top 30%, Average, Bottom 30%). Visibility of each line can be toggled by clicking the name of a line in the graph legend. 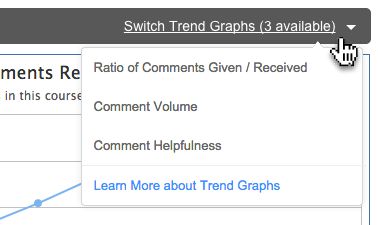 Switching between different graphs is quick and easy; above each graph is a dropdown labeled “Switch Trend Graphs” – just click this dropdown for easy access to each of the three reports. This graph is meant to help instructors see, in general, how much feedback each reviewer has given in relation to how much they’ve received. 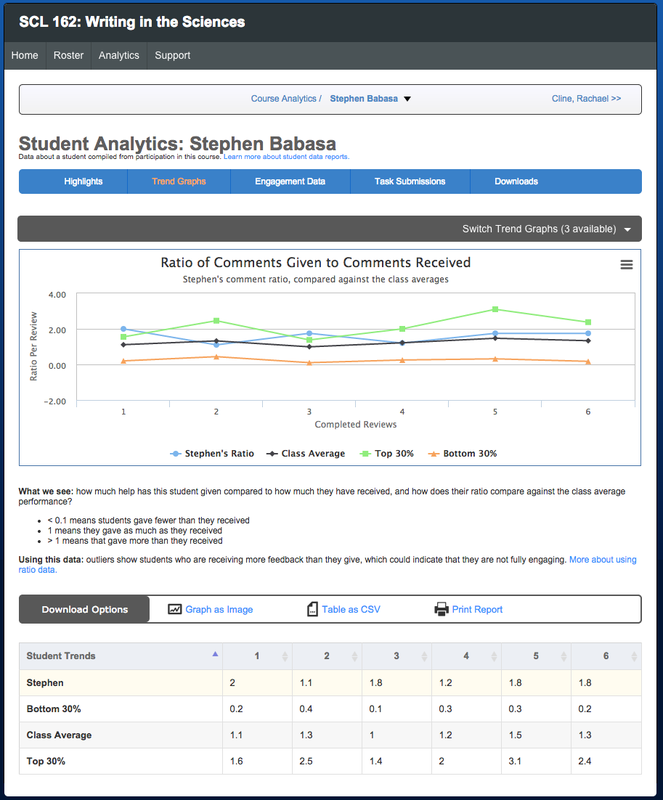 The given/received ratio is calculated by looking at the number of contextual comments exchanged during reviews and, for the class average, the individual averages are aggregated into a single score. Ideally, this graph would show a straight line – the closer the ratio is to 1, the more evenly distributed feedback is between writers and reviewers. If reviewers regularly receive more feedback than they give, help students figure out why they are not commenting as much as their peers. Do they lack commitment? confidence? 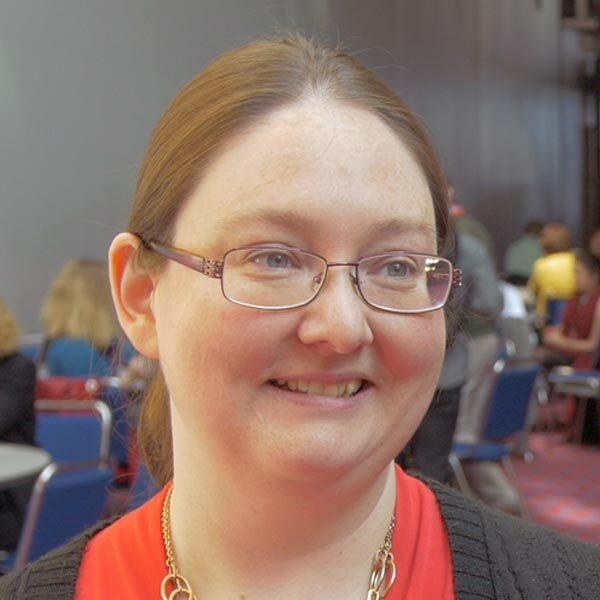 Help them look through other comments to figure out the first 3-5 words a reviewer uses to get started. If reviewers regularly give more feedback than they receive, guide student to figure out if the quantity of feedback they are giving is actually helpful for the writer; these over-commenters need to develop better strategies for offering only the most critical feedback. Or, these reviewers might benefit from being moved to a group where everyone is an over-commentor. This graph is meant to help an instructor see, in general, how much feedback is being exchanged during reviews. 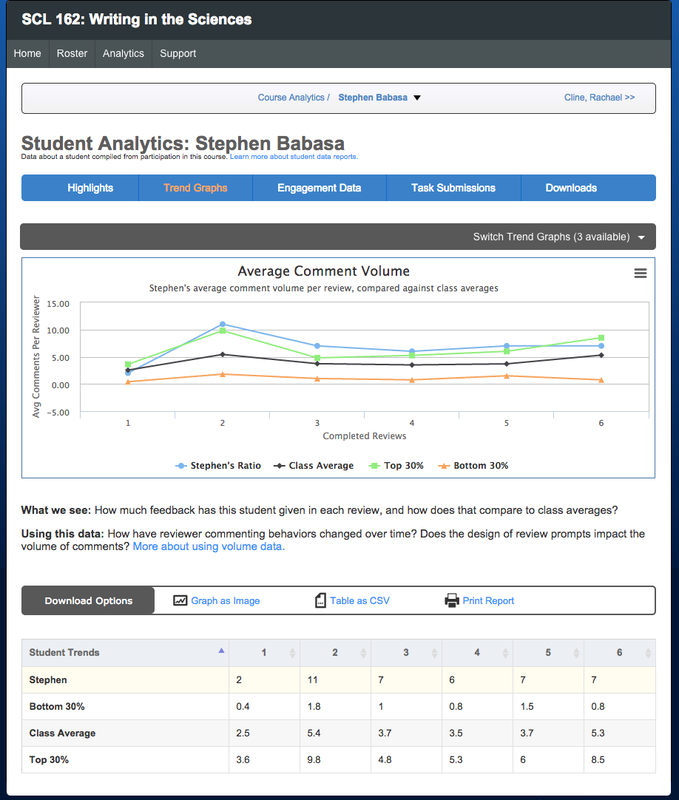 The table below the volume chart lists the exact number of comments given by every reviewer who participated in a review as well as the class average for comparison. Writers are given the option to rate each comment they receive on a scale of 1-5 stars. While it’s up to the individual instructor to coach students to rate their feedback and how to assess it (what a one-star comment looks like compared to a five-star comment), those ratings are compiled in this trend graph. have the quality of comments improved over time? 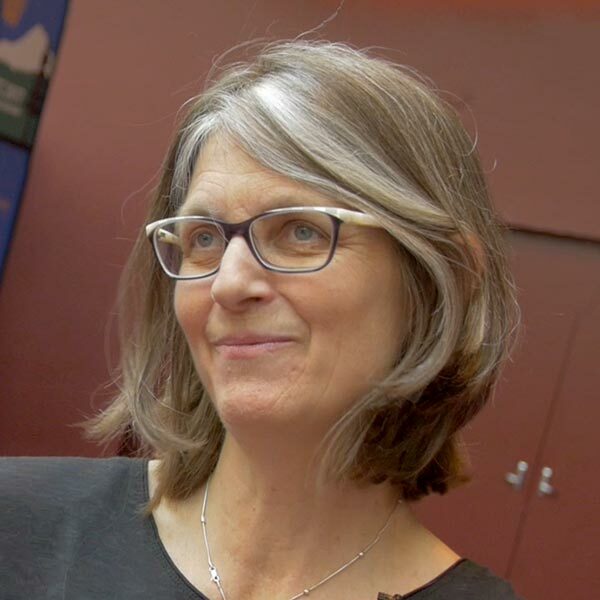 have students learned to better distinguish helpful from unhelpful feedback? Common trends: ratings graphs often slope downward over time. In early reviews, writers are eager to rate all of the feedback they receive very highly our of a desire to be friendly and collegial. Over time, as they get better at differentiating helpful from unhelpful feedback, ratings will often decline as they begin applying higher ratings more infrequently. The table below the helpfulness chart lists the helpfulness averages for individual students on the comments they gave as part of a review. This report expands on the data available both in the Highlights section of the student report but also the Average Student Profile data of the Course Analytics Report. 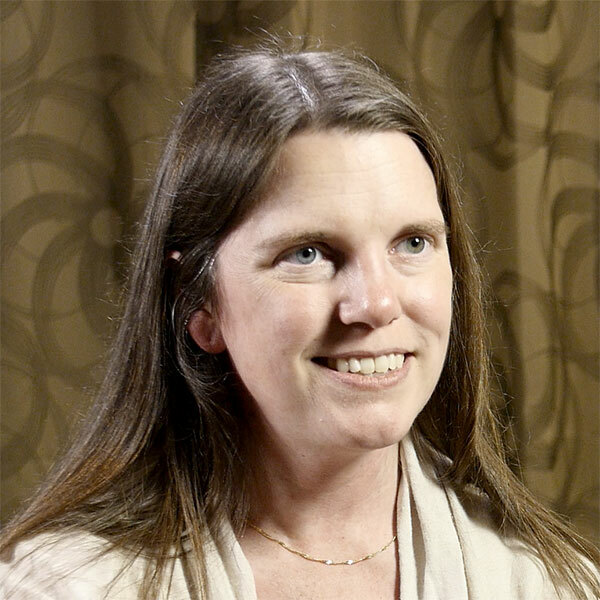 Its purpose is to help instructors understand what the performance of a student looks like across all of their Eli reviews and to quickly be able to see how that student’s performance compares against the rest of the class. 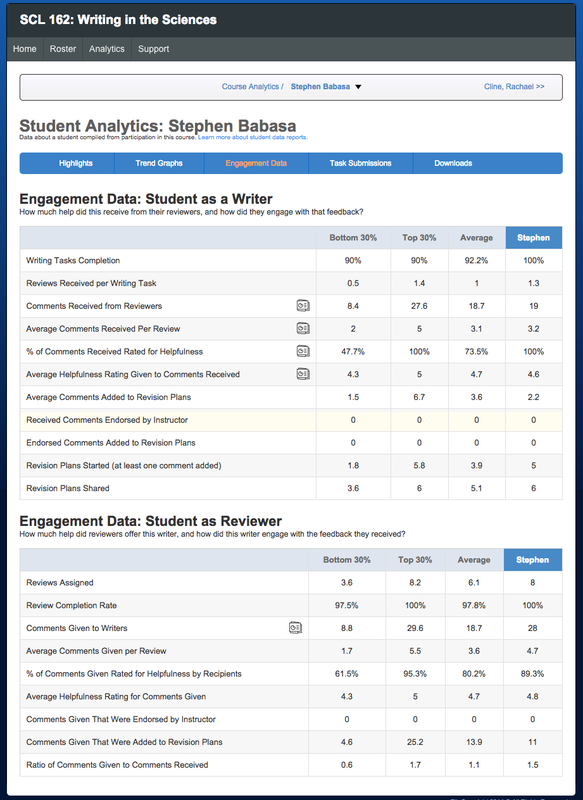 The Engagement Data report in Student Analytics. The data in these tables is intended to help instructors answer larger questions like “how much help did each student receive?” when compiling reports on student performance and engagement. This report doesn’t provide any analytic data but does serve as a repository for all work done by the selected student. From here, instructors can see, overall, how much of the assigned work a student has completed and can get a detailed breakdown of student performance on each assigned task. 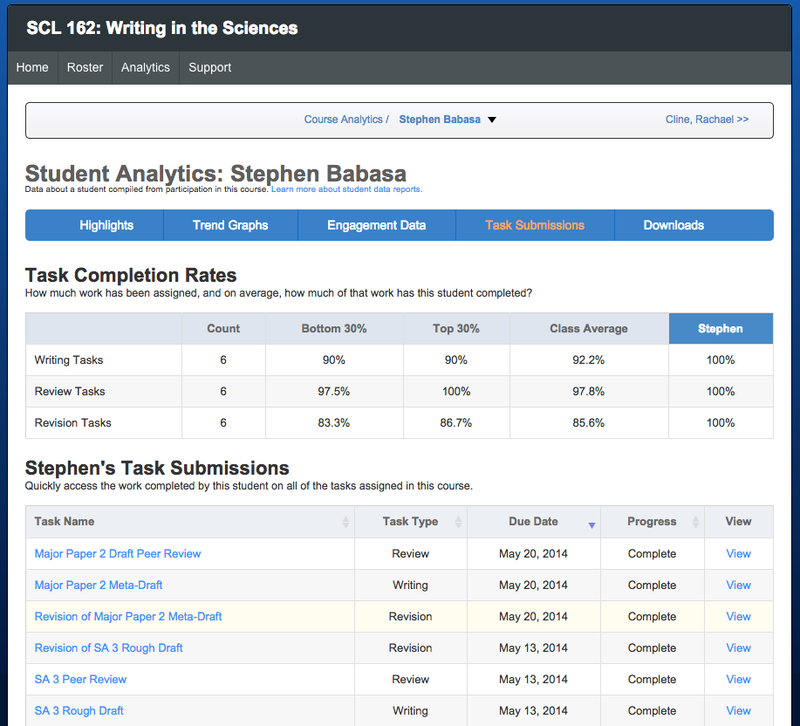 The “Task Submissions” report displays all of a student’s work in a course. Clicking the name of any task in the “Task Submissions” table will load that student’s submission on the selected task. 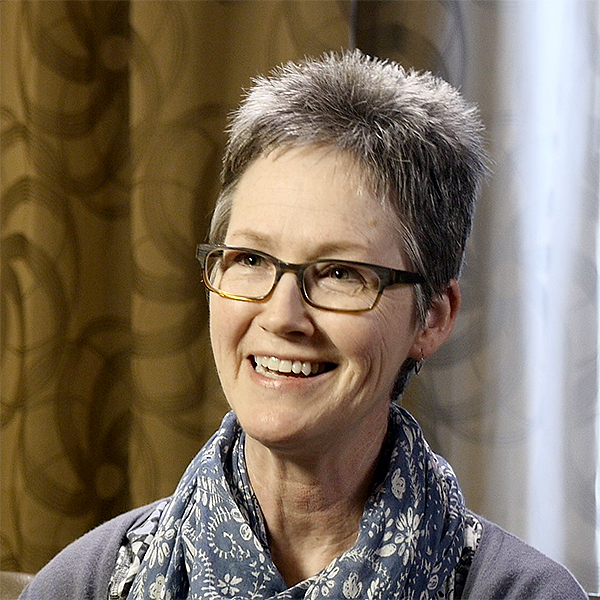 These features give instructors the ability to download all of their raw student data. 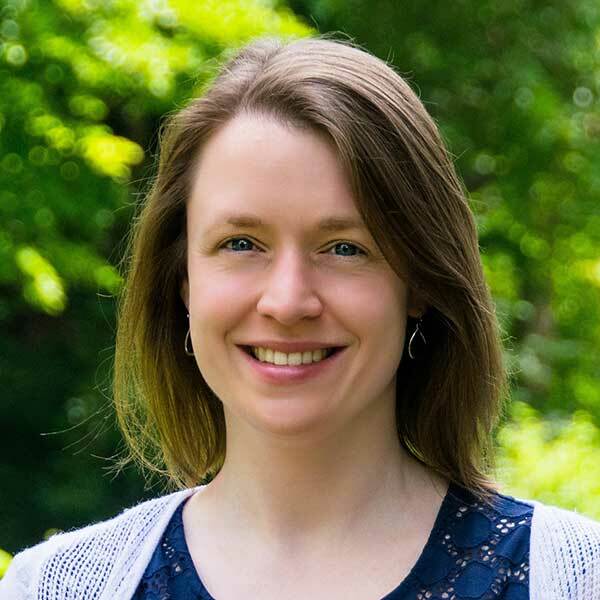 While most of this data is accessible through a browser, these tools allow instructors to take the uncooked student data and perform their own queries and sorts with it. This is particularly helpful for teacher researchers investigating their own practice or writing researchers studying student review behaviors. Download options for student-level data. Suspended students: any trend data (like engagement highlights) excludes students who have been suspended from your course. Those students will still be represented in the report of individual tasks, but they will not be considered when calculating overall trends. Revision plans: students can initiate a revision plan on their own or they can be assigned one. The data points reflect this distinction and focus on instructor-initiated revision plans. Trend graphs: graphs are dependent on the use of contextual comments in reviews. Reviews that do not have comments enabled are not included in the graph.